The Knight of Wands, while not a Major Arcana, is also not one of the ten numbered suit cards. It – and other court cards like it – fits somewhere in between the two. While the numbered cards represent the energies of the suit as they are shaped by passing through the Sefirot, and the Major Arcana represent the path that energy takes between Sefirot, the court cards represent the effects that the energies of a particular suit have on the personality; the four court cards show the different aspects of a suit as they may manifest in the characteristics of a person. Each court card also is associated with a Sefirot; the Knight is associated with Chokmah, as in many ways the Knights embody the symbolic masculine, and the active nature of each suit. Similarly, in the Court Card narrative, the Knight of Wands represents the young prince from a distant kingdom who has overthrown the previous king and married the older queen, and so embodies conquest. 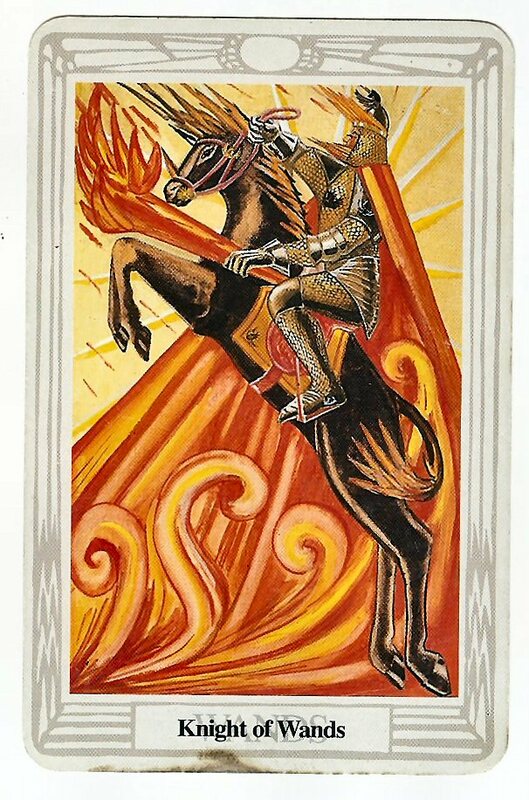 The Knight – or King in some decks, like the Rider-Waite – is associated with the element of Fire; the Knight is the active, passionate court card. The Knight of Wands, then, can be said to be the fiery part of fire. As such, he represents what happens in a person when fire is made larger by more fire. The personality of the Knight of Wands is that of an exceedingly passionate, courageous, charismatic, strong-willed, determined, active, creative, unpredictable, and proud person. On the other hand, he can also sometimes be cruel, bigoted, brutal, rash, and single-minded. He is the exemplar of the nine of Wands; Strength. A bold leader unafraid to do what needs to be done, he leads with passion, creativity, and powerful force and drive. He can, however, become blinded by his actions, and become wrapped up in his own strength, leading him to become bigoted or arrogant. He also sometimes may expect too much of other people, leading him to come off as brutal or cruel. In his belief that he knows what is best, crossed with his passion, the Knight of Wands also is often rash and impetuous – though usually does not mean harm. The personality of the Knight is like that of a young, new ruler, eager to prove himself to the world – and to himself. The Rider-Waite art shows a man sitting on a throne, holding a wand and sternly looking over his kingdom. In his gaze is the will and drive of his personality, but this art to me seems lacking. The Thoth art, on the other hand, shows a Knight upon a rearing horse, while in the background flames shoot up all around. To me, this embodies what the Knight of Wands is; fiery, passionate, and ready to lead at the front of the line. His rearing horse gives him stature and makes him imposing, and he has the appearance of being ready to charge forward bravely (and maybe rashly). Power just oozes off of him. In a reading, the Knight of Wands indicates that someone with the above personality plays a strong role in the situation – this person could be yourself, someone you know, or someone you don’t know. Think about how these aspects of personality apply to yourself and those around you. Has someone recently been promoted and is using their new power to assert themselves? Are you? Reversed, this personality is twisted somehow; perhaps someone around you is really a Knight of Wands though (s)he does his best to hide it, or perhaps these energies are negatively affecting your life. It is bad form to read a reversed court card as representing the negative qualities of the court card, but still sometimes this interpretation leaks out to me; a reversed card represents the energy twisted in some way, and while I don’t read this as representing exclusively negative traits, it makes me more carefully examine those negative traits, and if they are present then it emphasizes them. It also means to me that the traits of the Knight are there, but in forms that you may not immediately recognize.